The ModuSat satellite heating unit forms the heart of the Evinox communal heating solution. Providing Independent, fast recovery hot water and high efficiency heating for each apartment or home, and removing the requirement for individual boilers and a gas supply in each residence. The units are fed by a central plant room, which reduces the buildings carbon foot print and allows the integration of renewable heat sources. 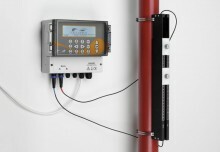 Evinox can also provide the central plant room equipment and building controls. This is in line with latest legislation encouraging a move away from the use of higher carbon emitting individual heating and hot water systems. The design of the ModuSat provides the end user with the same autonomy as if they had their own boiler and tank. This includes a meter for billing of energy usage and cold water consumption for each apartment or house, and where required it also offers a facility for both heating and cooling. The ModuSat storage model is available as either a floor standing or wall mounted unit, and the range includes 75, 150, 300 and 400 litre models. The integrated storage within the ModuSat enables centralised plant space to be greatly reduced due to the increased thermal storage facility in each dwelling. New additions to the ModuSat range include both single and twin plate units, which utilise a plate heat exchanger rather than incorporating a hot water tank for the fast supply of hot water. 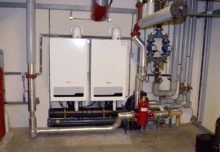 These heat interface units are particularly suited to smaller projects where there is a low hot water draw-off required. All ModuSat units are manufactured using high quality components to provide excellent reliability and are well insulated to keep heat losses to a minimum. Other communal heating units use traditional flow regulating valves to keep the system balanced, but the ModuSat is self balancing and does not require any mechanical intervention. 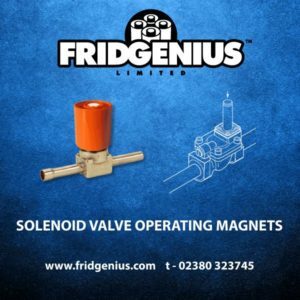 The required flow rate for the system is set into the ModuSat prior to operation and the flow meter and probes continually monitor it and adjust the energy shut off valve with modulation to ensure the unit always has the required flow rate. The benefit of this self balancing system is that the flow rate can be read, and changed if required, via the master panel in the central plant room or from the software remotely, removing the requirement to check or correct the flow rate on each unit. This is especially useful when the equipment is being commissioned. 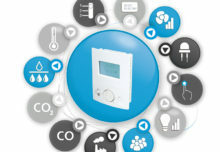 The ModuSat in-built energy meter can be tailored to meet the requirements of the building operator and residents, ranging from simple read-only meters to a Pay-As-You-Go system, or a complete remote billing solution using BUS communication to provide the end user with a fully itemised energy bill. In addition to this, a unique feature of the ModuSat software is the ability to not only download data from the unit but to also upload data to provide control remotely. This can include an SMS control facility for the occupiers. 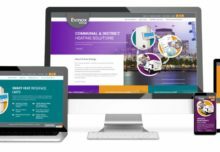 At Evinox we provide an end-to-end communal heating solution, which Includes surveying and assessment, design, project support, equipment supply, installer training, after-sales service, and billing and revenue Management, removing any worry or burden from the building owner and operator. 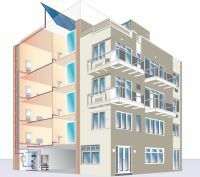 Discover better multi-occupancy heating with Evinox. 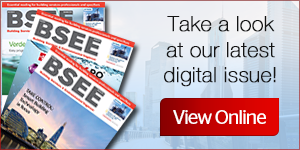 To see how we can help, call 01372 722277.